To monitor your AWS environment, Cloud Security Plus requires a valid IAM user with necessary permissions. The solution will use the designated IAM user to collect logs from your AWS environment. Note: Cloud Security Plus supports all AWS regions, except the AWS China (Beijing) region. To create a new IAM user, follow these steps. Go to AWS Services → Security, Identity and Compliance → IAM → Add User. Give an appropriate User name and enable Programmatic access. Click on Create Policy → Create your Own Policy. Fill in the Policy Name field. Depending on whether you want to manually or automatically configure CloudTrail, copy and paste the inline policies accordingly. Auto-configuration: If you want Cloud Security Plus to configure CloudTrail, copy and paste the inline policy in the Policy Document box. Manual configuration: If you wish to manually configure CloudTrail, copy and paste this inline policy in the Policy Document box. Create the user and save the Access key and Secret key pair. The generated access key and secret key pair should be used inside Cloud Security Plus to configure the AWS account. Go to the Cloud Security Plus console. Select the Cloud Type as AWS. Enter the Access Key ID and Secret Access Key of the IAM user in the given fields. Auto-configuration: Select the Region. Cloud Security Plus automatically creates and configures CloudTrail. Click Save. 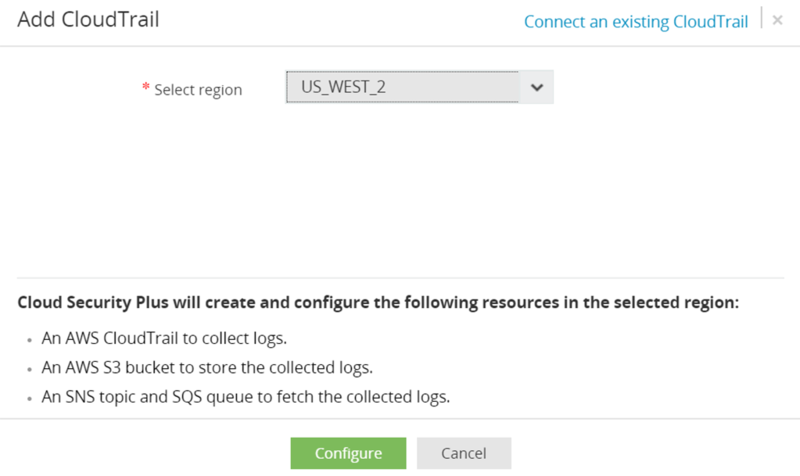 Manual configuration: Click Connect an existing CloudTrail and follow the steps given in the Logging setup for AWS CloudTrail. To setup logging for your AWS environment, refer S3 server access logging and ELB access logging .